Using eye tracking and other biometric tools to better understand ourselves. ­The world is entering a new era of cognitive science that allows us to understand human behavior better than ever before. In fact, the Organization for Economic Co-Operation and Development recently labelled the 21st century the "Age of Biology," noting the growing impacts of the ongoing life-science revolution, which the group predicts will change economies, create new technologies, and broadly reshape our lives. For planning, this new age means we can record how people see and feel about their surroundings, not as machines, but as animals keen on connection and ruled by anxieties. Imagine being able to collect real-world, real-time data about emotional habits in the built environment and to definitively answer perennial questions such as why people enjoy walking through miles of a dense urban settings like Manhattan but consistently shun barren landscapes like Boston's infamously empty City Hall Plaza. Today it's possible. With affordable new tools, we can track subconscious predispositions and use metrics to explain the human response to an existing development or predict responses to a new development. Planning will become trackable and quantifiable in ways unimaginable in the 20th century. As a species, we are also unique because we are so visual. Half of the sensory information going to our brains is visual, according to Nobel-prizewinning neuroscientist Eric Kandel. This means that more of the human brain is devoted to visual processing than processing any of the other senses. No wonder visitors from around the world like walking through Venice or Copenhagen — there's so much there to stimulate our sensory system, no matter one's native language, culture, or personal history. Understanding how much of our brain is concerned with "seeing things" can give planners a better feel for why visual stimulation matters for not just our species, but also our spaces. With this visual bias in mind we (the authors) set up a pilot study at Boston's Institute for Human-Centered Design in December to better understand how people take in their world. We turned to eye tracking — a biometric tool that marketers, web designers, and others frequently use to determine how customers actually see things. 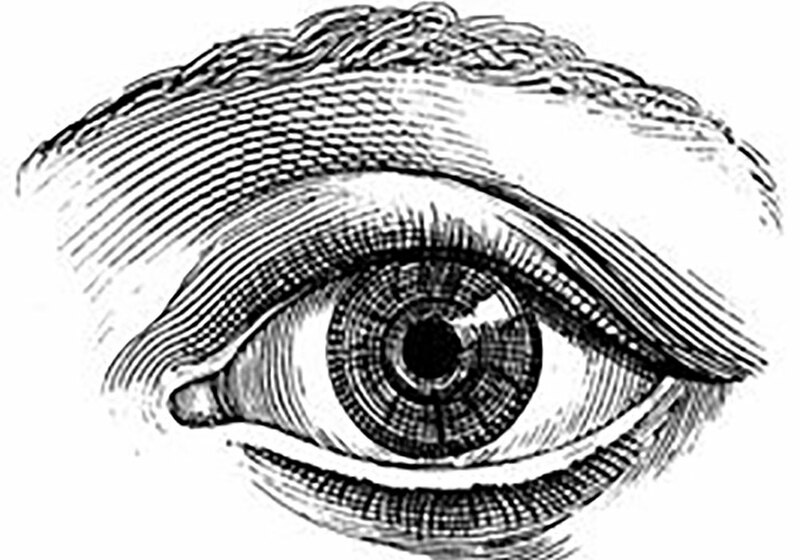 Eye tracking measures subconscious eye movements (as many as five per second) as people experience their surroundings. It then creates an image of where people look, what they focus on first, and where their eyes repeatedly return. One benefit of this technology is that it is relatively inexpensive, portable, and easy to interpret versus other biometric tools like facial expression analysis and EEG (which measures our changing brain waves), which require more time and expertise to interpret. On one table, we set up a monitor and eye tracker on a tripod. On the other, we placed the laptop running the study and analysis software from iMotions, a platform specifically designed to synthesize data for human behavior research. Volunteers faced the monitor one at a time with the test administrator calibrating each setup and performance. To keep things simple, we selected 50 images for the pilot study; half of them of buildings, including interiors, and the other half things people commonly look at, such as faces and landscapes. Charline LeBrun, left, monitors a test with a volunteer during the pilot study at Boston's Institute for Human Centered Design. We divided images into four sets so that our 33 volunteers, ranging in age from 18 to 80, could take breaks as desired. The iMotions software aggregated all our users' data and created attractive graphic representations, showing where and how people took in the scene. It also told us how people looked at images in ways they may not realize, giving us a graphic representation of our collective subconscious processes at work. One big takeaway from our pilot study was how humancentric our perception is. We saw why Jan Gehl, the well-known Danish planner, likes the ancient Norse poetry quote: "Man's greatest joy is man," supporting his belief that the best-planned cities encourage gathering, filling our innate need to see each other. Take, for example, the photo of Copley Square in downtown Boston showing the iconic Trinity Church, built in 1877, adjacent to the infamous glass skyscraper built in 1987 and formerly called Hancock Tower, but now known as 200 Clarendon. The heat map glows reddest where people looked most and returned their gaze most frequently. Their tightest focus was on an art installation of a man on a raft affixed between the 44th and 50th floors of the glass tower. Within 15 seconds, viewers went back to check him out more than 190 times. Knowing that the human eye can make four to five movements (called saccades) per second helps to explain the high count. "I realized how people are really attracted to people," said Charline Lebrun, IHCD's former design intern, after running the test. "A lot of scientists say that we watch each other a lot, but I was not convinced until I saw it firsthand." Evidence for our human centric biases continued when we eye tracked Boston City Hall and its surrounding, often empty, plaza. People spent more than half the 15 seconds allotted for the City Hall photo checking out other human beings rather than the building itself, even if they appeared as tiny specks in the photo! In another image, a portrait of the Boston mayor at the time City Hall was built in 1968, test-takers also went straight for his face, effectively ignoring his surroundings. These results revealed that the most important thing for us to see is each other. We think the ramifcations for planners are huge. Though preliminary, these sorts of studies are significant for planners and planning students, says Justin B. Hollander, PhD, AICP , associate professor of planning at Tufts University, in Medford, Massachusetts, and coauthor of Cognitive Architecture: Designing for How We Respond to the Built Environment, because they help us understand how human perception works and creates our experience of the built environment. They also give planners ways to test and compare plans and outcomes. "Arguably, most planning history has not even been human centered, but in recent decades, there's been a growing interest in designing places through the lens of the human experience," says Hollander. 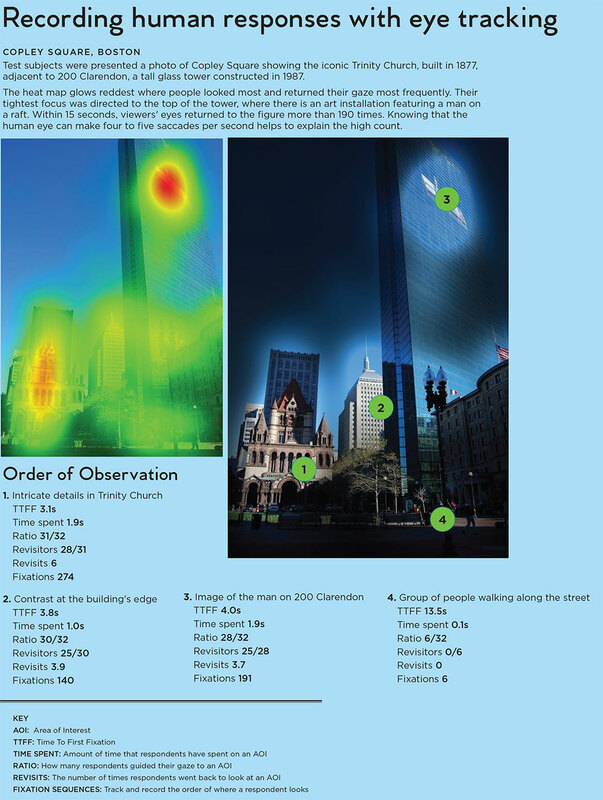 "Eye tracking allows us to gain an insight into the human mind [previously unavailable] in the history of urban planning. . . ."
Later this year, Hollander and his students plan to work with the city of New York's Department of Design and Construction to research humans' interaction with the city's public buildings and spaces. "What I'm doing is using eye tracking to study the instant subconscious response people have to different urban scenes to inform the design of the built environment," he says. "The planner of tomorrow will need these in their toolbox." Graduate students in planning and architecture at the University of Cincinnati's College of Design, Architecture, Art, and Planning use eye-tracking technology to tackle an often overlooked subject: signage and wayfinding. "A lot of signage is less effective than it could be," says Christopher Auffrey, associate professor of planning at the University of Cincinnati. "When design review boards create sign codes, they don't often consider the diverse context of sign placement, and that a one-size-fits-all approach might not work very well." Auffrey, along with Henry Hildebrand, professor of architecture and interior design, and Vikas Mehta, associate professor of urbanism, are part of the Communication in the Urban Environment initiative which promotes a scientific, metric-based approach. "Eye tracking helps signage designers and planners understand the effectiveness of signs and implications for sign codes," Auffrey says. 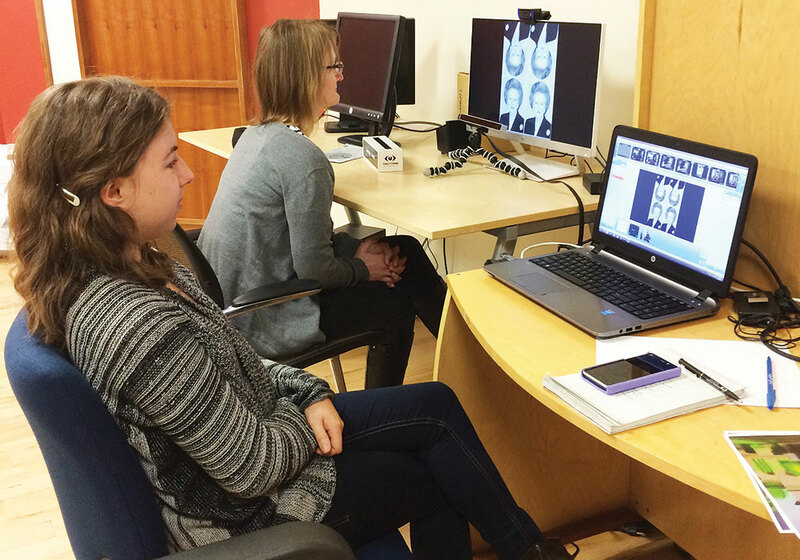 Rather than setting up an eye-tracking lab, students in the CUE seminars use eye-tracking emulation software, which predicts where people will look based on eye-tracking algorithms. This emulation package (3M's Visual Analysis Software) lets students input a photo or video and outputs images showing how and where people look first. Researchers then use this information to report on and suggest design changes to make the signs stand out. For example, a triptych shows the scene outside the Senate, a restaurant in downtown Cincinnati. A student team took the photograph, then uploaded it to the emulation software to see how it is viewed. Students then edited the original image in Adobe Photoshop to improve the sign's "attention-getting" power. The software predicted that their redesign, substituting red for white neon lettering, increased the sign's allure from 67 to 80 percent. Working with biometric data gets students to ask new questions, such as, "How do we communicate in the built environment?" says Auffrey. 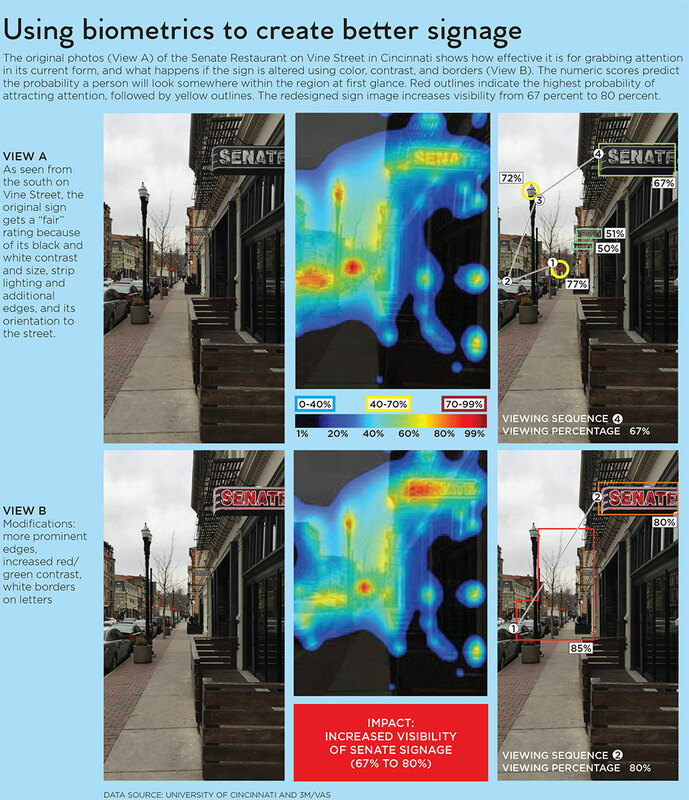 Projects and studies using biometric data pinpoint how placement, color, and qualities of the surroundings impact perception; specifically, they demonstrate how cars, bicycles, wires, and windows compete for our attention in congested urban settings. How to get "human factors into the design process," is also a focus at Columbia University's Cloud Lab, says Mark Collins, assistant professor at the graduate school of architecture, planning and preservation. "How do people feel in a space? Do they feel safe? Are they comfortable? Are they excited?" Collins asks. Biometric techniques hold so much potential for planning because they "make quantifiable what we intuitively know and show us what we don't expect," he adds. Students at Columbia's Cloud Lab have used eye tracking to determine how designers looked at architecture differently than laymen and as a tool to guide preservation efforts in unique structures, such as the concrete-podlike Nakagin Tower in Tokyo, built in 1972 and currently under renovation. Results could inform choices of what elements of the building to save. Collins's team provides students with other biometric tools, too. Along with eye trackers, students use sensors that can measure our changing feelings and whether they are positive or negative. "For us, EEG is the main goal. What could be a better window than what is going on in the brain?" Collins asks. "We're also looking at Galvanic Skin Response, but EEG research is our next multiyear project connected with biomedical engineering, hardware development, and neuroscience." GSR monitors skin conductance, which, like EEG — which captures brainwaves — can clue researchers into shifting emotional states. Collins sees biometric literacy as mandatory these days since designing the built environment is "not just about drawing anymore" in an increasingly device-driven world. Building the new toolkits to effectively bridge the divide between human experience and architecture and planning is also a goal of Colin Ellard, associate professor of psychology at the University of Waterloo in Ontario, Canada. Ellard has a fascination for how streetscapes impact us, which he outlines in his book, Places of the Heart: The Psychogeography of Everyday Life. "The physical surroundings of our lives influences everything we do," he persuasively writes, examining how buildings and street layouts affect our brains, bodies, stress levels, and overall health. Ellard says that taking people on walks through contrasting urban settings is key to understanding how we feel and function, both subconsciously and consciously. He outfits study participants with specialized eye-tracking glasses, worn as they walk, along with other biomonitors, including heart-rate and GSR sensors. At prearranged spots they stop, take in the scene, and record their thoughts. "I'm interested in the mobile eye tracking out in the world," he says. "We are constantly trying to gather information about the urban pedestrian experience to understand the influence of buildings on people's behavior. . . . If we're seeing the bottom eight feet of a building, how do we optimize the building facade? Which parts are getting attention? With eye tracking we can measure that." The resulting data, in theory, can help create more human sensitive places, better for our bodies and brains. Ellard's team is starting to offer workshops for planners and architects to showcase this approach along with developing a "generic, reusable toolkit that can be applied anywhere." As our understanding of the human experience becomes broader because of biometrics, the opportunities and implications for planners and allied professions are vast, including new ways of working with people of diverse expertise. "There are lots of neuroscientists and psychologists who are interested in this intersection between psychology, architecture, and planning," Ellard says. "We've got to find ways to work together." Ann Sussman is coauthor of Cognitive Architecture: Designing for How We Respond to the Built Environment and writes the blog GeneticsofDesign.com with Janice Ward. Ward is a writer and STEAM (Science, Technology, Engineering, Art, Math) education advocate. Cognitive Architecture: Designing for How We Respond to the Built Environment by Ann Sussman and Justin Hollander (Routledge 2015). Places of the Heart: The Psychogeography of Everyday Life by Colin Ellard (Bellevue Literary Press 2015).